Perennial coneflowers (Echinacea) are the workhorses of the summer garden. They pump out daisylike flowers, yet thrive in full sun and heat, have virtually no pest problems, and can take less water than most other perennials. They’re also some of gardening’s great bargains: Plant two or three coneflowers, and their nectar-rich centers will entice butterflies and honeybees to your garden for free. That’s true whether you grow the common purple coneflowers (Echinacea purpurea) with huge pinkish flowers, or ones from the new generation of coneflowers, with flowers of yellow, white-green, orange, or reddish purple. Grow Echinacea plants from seed in spring, or transplant in spring or fall. Use coneflowers in wide borders with other robust perennials, like gloriosa daisies, or on the outskirts of gardens (they go dormant in winter). Buy the biggest plants you can find and you’ll have the most bloom the first year. Coneflowers need full or filtered sun and they’ll bloom from summer through early autumn or longer if you keep dead flowers picked off. Give plants soil with good drainage and don’t pack them in too closely with other perennials, since root competition makes them struggle. At season’s end, you can let flowers go to seed. Finches love them—nothing is prettier than goldfinches feasting in the autumn garden. And the seeds that fall to the ground will self-sow, giving you more plants for next year. ‘Magnus’, a purple variety, has 7-inch flowers with more horizontal petals. ‘Kim’s Knee High’, another has smaller, bright pink flowers on shorter, two-foot stems. ‘Doubledecker’ looks like a coneflower earing a hat made from pink petals. ‘Razzmatazz’ sports a double pompom top and a skirt of trailing pink petals. ‘Fragrant Angel’ is a pure white variety. For a light green with a reddish flush at the base of each petal, grow ‘Jade’; for a purple perennial flower with green tips, try ‘Green Envy’. Yellow varieties originate from the early-flowering pale yellow coneflower Echinacea paradoxa, but you’ll get the most intense color from the sweetly scented ‘Mango Meadow Meadowbrite’, ‘Harvest Moon’, or ‘Sunrise’, whose yellow petals surround a deep golden cone. 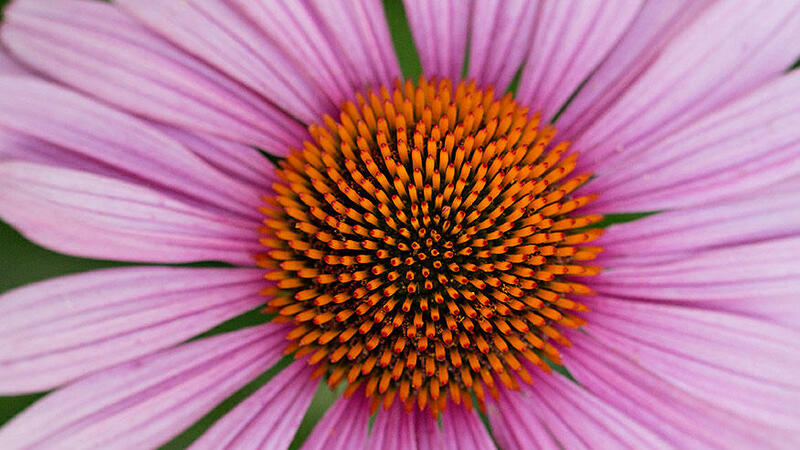 Orange type resulted from a cross between yellow and purple coneflowers. ‘Orange Meadowbrite’ is one of the best. ‘Sunset’, is a more purple-orange, with a rusty red cone and spoon-shaped petals, while the award-winning ‘Sundown’ has the most intense color of the lot. ‘Twilight’ has the same intensity in red-orange. Coneflowers have seen an explosion of colors in recent years. Look for flowers in shades of purple, white, green, orange, yellow, and red.